The principles of planning a vegetarian diet are the same as planning any healthy diet — provide a variety of foods and include foods from all of the food groups. A balanced diet will provide the right combinations to meet nutritional needs. But be aware of potential nutrient deficiencies in your child’s diet and figure out how you’ll account for them. With a little exploration, you may find more vegetarian options than you realized. Are you sure that your child’s nutritional needs are being met? If not consult a professional for help. I must apologize for missing our Earth Day celebration. On Tuesday morning I woke up feeling bad and my health rapidly declined after I uttered the famous words “I think I can make it.” The bad decision to leave my home ended with my office mates re-packing my car and sending me home. The diagnosis was a stomach virus of which I will spare you the details. I was so disappointed that, as a work study so affectionately (Not!) put it ” on my only day of the year to shine” I was too sick to perform. If there was any way I could have “limped” my way through the day, I would have done it. So I apologize to all of you that we’re inconvenienced in any way by my Earth Day absence. Once I get a chance to synchronize my calendar with some others on campus I will (re) create my display and “Made in Georgia” raffle. Thanks for your understanding and continued support. Another excerpt from the Time magazine article Eating Better than Organic. Whats your definition of local when it comes to food? Have you ever looked at where your food originates? I’ll admit until yesterday I never really looked at where the products I purchase originated. After a 1.5 hour trip to Whole Foods I was pleasantly surprised at how many products are locally produced. From wine to salsa there are lots of items that are made right here in Georgia. I was so happy with the results of my “scavenger hunt” that I decided to share the goodness with you. Visit the Office of Sustainability display at Earth Day to have the chance to win a “Made in Georgia” basket filled with products made in the Peach State. LIFE University’s Earth Day celebration will be held on April 23rd in the CUS plaza from 10:30am to 2:00pm. 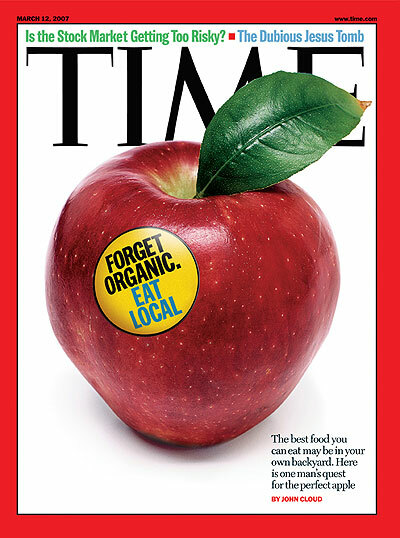 This year the theme for our display will be “Eat Local, Think Global.” I recently saw a Time magazine cover that read “Forget Organic, Eat Local” which sparked my interest. After reading the article I wondered how many people in the LIFE community would agree with the statements outlined in the article. This week we will feature statements/opinions from the article in preparation for a fun Earth Day activity. So take some time this week to read the article and let me know what you think! Here is an excerpt from the article….which apple would you choose? Not long ago I had an apple problem. Wavering in the produce section of a Manhattan grocery store, I was unable to decide between an organic apple and a nonorganic apple (which was labeled conventional, since that sounds better than “sprayed with pesticides that might kill you”). It shouldn’t have been a tough choice–who wants to eat pesticide residue?–but the organic apples had been grown in California. The conventional ones were from right here in New York State. I know I’ve been listening to too much NPR because I started wondering: How much Middle Eastern oil did it take to get that California apple to me? Which farmer should I support–the one who rejected pesticides in California or the one who was, in some romantic sense, a neighbor? Most important, didn’t the apple’s taste suffer after the fruit was crated and refrigerated and jostled for thousands of miles? I love to give away stuff things. It makes me feel like Oprah. You remember the episode when Oprah gave each member of her studio audience a car, “You get a Car and You get a Car”. 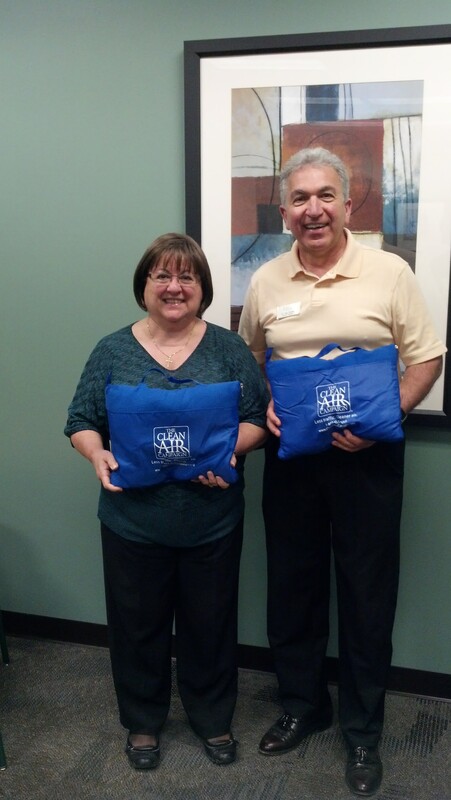 I am definitely not giving away cars but yesterday I did have the pleasure of delivering travel blankets to Mrs. Lucia Paolucci and Dr. Dan Michel. If you stopped by the Clean Air Campaign table at FSDP this quarter you know that these blankets were part of a raffle for LIFE employees. Dr. Michel and Lucia won the blankets and were kind enough model them for A Sustainable LIFE. I would like to personally thank them both for being such great supporters of our sustainability efforts. If didn’t get a chance to meet them in person visit the Clean Air Campaign for more information on commuter programs.